Time flies and it has already been over half a year since Angel began attending art classes at heART Studio. Even though we were kindly sponsored for two terms, you have to know that I didn't write these reviews for the sake of writing. The fact is, I did see the progress and development in my girl slowly but surely, and that is the only reason that propels me to be willing to pay the fees so that she can continue being a little artist. Today, I'm not just going to share about what Angel painted in class, I'm also going to share with you my thoughts on how she has improved and grown over the months. The theme for this project was one of her favourite animals and one that I find particularly intriguing - The Owl. Besides being nocturnal, did you know these owl facts? - There are more than 200 different owl species. - A group of owls is called a parliament. - Owls can turn their heads as much as 270 degrees. - Owls are far sighted, meaning they can’t see things close to their eyes clearly. I find it interesting and helpful that besides teaching the children to draw and paint, Teacher Syafiq also makes use of charts, illustrations and multimedia to impart some basic knowledge too. For instance, he taught the kids about three different types of owls and how to distinguish them, before letting them choose their favourite for the final artwork. 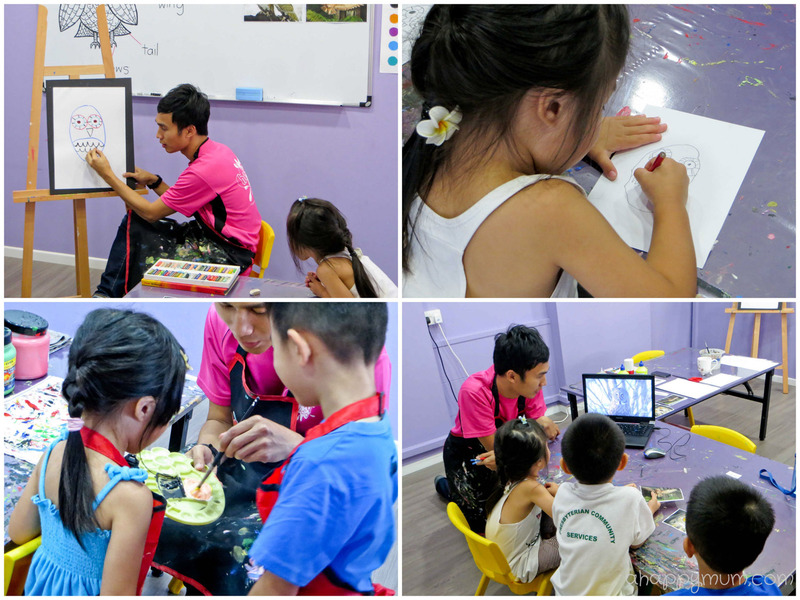 In the first lesson, he also taught them how to draw a simple owl step by step. Ok, it doesn't look simple at all to me but that's the amazing part about heART Studio, they make drawing seem effortless and give such clear and concise instructions that every kid will be able to achieve it ultimately. This is my girl's first self-drawn owl. Ah huh, owl, not monster. Well, a little far off from Teacher Syafiq's but hey she is only coming to four years old and this was done in less than half an hour. Even though the hubby laughed when he saw it, we kind of doubted that we could draw better owls when we were this young. Of the three owls, namely snowy owl, great horned owl and barn owl, it wasn't surprising that she chose the beautiful, white snowy owl. Next, it was time to work on her final artwork starting from painting the background to drawing the foreground and finally adding on the details. Besides using different shapes and lines, the kids also learnt that mixing colours will produce a new colour, for instance a boy requested for a beige owl and Teacher Syafiq demonstrated how red and yellow combine to give you orange and add in some white, you get a nice beige colour. As she was painting the owl, Teacher Syafiq turned around to ask me not once, not twice but a few times "Has she been practising at home?" I can't say she has been faithfully practising even though she does like to doodle, but at the same time I totally understood why he asked that. From a girl who couldn't confidently draw straight lines, paint within the borders and could never decide on a colour when tasked to, she now holds the brush firmly, shouts out the colours and even paints zigzag lines very well! Despite that she might not be the most advanced or fastest learner in the class, I look at how far she has come since Day 1 and oh my, it makes me beam with pride. 1) She is more patient now and doesn't hastily finish up her work towards the end of the class like she did before. 2) Although she is still easily distracted by her peers and surroundings, at least she makes sure she does own her work too. 3) She can better listen to instructions and at the same time inject creativity into her own artwork. 4) Most of all, where she was previously so terrified of making mistakes and dared not venture out, she is now much more confident of herself and is not afraid to take the first step. Ta-dah! How do you like her colourful, striking snowy owl? This is one of my favourites so far because I could see the hard work she put into it and I am proud that she accomplished all the tiny details that made this beautiful owl one-of-its-kind. 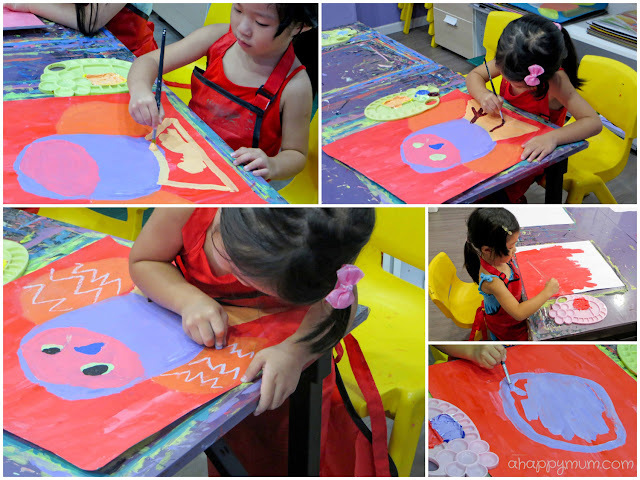 In my next and concluding review of heART Studio, I will share with you what I have gained from this journey and the things that art has taught me as a parent. Stay tuned!